This hotel in Hamburg offers soundproofed rooms, free Wi-Fi in all areas, and free underground parking. The main train station is 3 minutes away by city rail. Renovated in 2013, the brightly furnished rooms of the Wyndham Garden Hamburg City Centre Berliner Tor feature satellite TV, black-out curtains, and bathrooms with heated towel rails. Children stay in their parents’ room for free. Seasonal, international food is served in the Petit Miró restaurant and the Brasserie Miró of the Wyndham Garden Hamburg City Centre Berliner Tor . Guests can also relax on the Grand City Hotel’s summer terrace or in the bar. 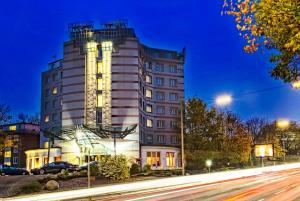 The Berliner Tor underground and city rail stations are a 3-minute walk from the Wyndham Garden Hotel. Trains run directly to the Reeperbahn nightlife area and the Mönckebergstraße shopping street. Discount vouchers for the gym at Hamburg Train Station are available at reception.